Vidalia brand onions are sweet, juicy, with a high sugar content and just a bit of a bite. The onions are actually not a botanical variety of onion. The name Vidalia is more of a brand name used for sweet onions grown in Georgia. 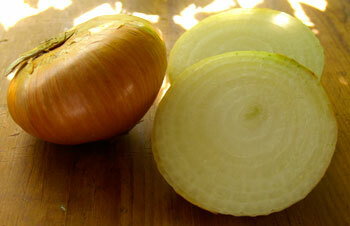 Legally, 24 different varieties of onions can be sold as Vidalias. Some are grano-type onions (which originated in Spain), others are granex-type onions (a cross between grano and Bermuda onions.) The grano ones will be rounder, the granex ones will be flatter at the top. Some Vidalias even start life in another state. To give the onion crop an early start, many Vidalias are actually planted in south Texas to start them, then transplanted to Georgia when the weather outside is warm enough for them there. To be called a Vidalia onion, the onion must be grown in one of twenty allowable counties in south-east Georgia. The counties in Southeast Georgia are: Appling, Bacon, Jeff Davis, Montgomery, Tattnall, Telfair, Toombs, Treutlen and Wheeler, as well as portions of Dodge, Jenkins, Laurens, Long, Pierce, Screven and Wayne. Vidalias are usually eaten raw. If you’re going to cook with them, use them in dishes where you can add them at the last minute and in which the basically still raw crunch will be fine, such as stir-fries. The aptness of the soil in Georgia for producing sweet onions appears, according to Georgia official doctrine, to stem from 1931, when a farmer named Moses Coleman in Toombs County, Georgia, planted onions for the first time. When he harvested them, they weren’t as sharp as he had expected them to be: instead, they actually tasted somewhat sweet. They sold like hotcakes, which was a real plus for him, as this was during the Depression after all. Other farmers nearby got into the onion growing business. But, it would be a mistake to believe that Vidalia onions are descended from Moses’s seed. Mose’s great discovery was the soil, not a special strain of onion. After then, though the date is not clear — either the 1940s or the 1950s, yellow Granex onions, which were already sweet by nature, were “imported” from Texas and planted. The Vidalia Onion Hall of Fame was established in 1991. The Vidalia Onion Museum, in Vidalia, Georgia, opened 10 April 2003. There was a farmer’s market at Vidalia, Toombs County, Georgia, and the onion just came to be named after that town. The Vidalia name wasn’t made official in law until 1985. In 1992, the State of Georgia’s Department of Agriculture registered the trademark, which it still owns.